In many ways it’s a shame this show fails at the first hurdle, in that it’s impossible to bring up in conversation with a title like that without feeling faintly embarrassed. And it’s a shame because the preview clips suggest that it might be quite fun, scratching that family entertainment itch that everyone says they want but nobody actually watches. And it’s only 30 minutes. In 2019! 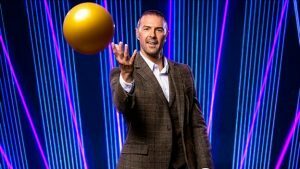 Paddy McGuinness challenges pairs to answer multiple choice questions. Balls of varying sizes will fall above the correct answer, hopefully you’ll be under it to catch it but failing that with some quick reflexes you might be able to save the situation. It’s a co-prod between 12 Yard and Possessed, so it will be intriguingly boring presumably. Let us know what you think in the comments. The first episode is going out after a Pointless bloopers special, so they’re giving it every chance. Didn’t realise this was destined for primetime. So glad they kept it to 30 minutes and Paddy is a great host for it. It’s a neat format which doesn’t need much more explanation than above. Basically 4 rounds, teams compete individually. In the first two rounds they answer two questions each, with a ball in the correct slot. The second round is the same except with other balls in the incorrect slots (20 years ago it would have been gunge!). Third round is catch as many as you can in 45 seconds on a theme, then the final is eliminate nine answers (pointlessly) to choose your answer to win £10k, but before you do it you can either take the money you’ve won so far or gamble to win the £10k that you’ve got the correct answer. This bit would probably work better if that decision was made seperately by the person not catching the ball. I rather enjoyed Catchpoint. The set looked good – and I don’t like dark sets but it worked here – the graphics were vibrant and looked really good. Lasers! The first question is a bit of a chestnut, but the others were all quite varied and interesting. Making the show 30 minutes long is a very smart move, I reckon you’d get bored after that. Plus, the pictures for each question must have made it a packet to make! Not quite sure Paddy is the right host, but it does need someone of that ilk to bounce around (literally) with the contestants. I look forward to CATCHing another episode. The 45 second round they could essentially just stand in the middle and hammer the button, and the final seems to be a lot of filler with the elimination of answers. Paddy feels slightly wrong but having said that I actually have no idea who would be right! Yeah, that was the one thing missing in the first few rounds, some sense of urgency. However, pointless spinning of the final question to make it try to feel different to all the others despite being exactly the same besides, I thought it was alright. I actually thought the lasers were a bit much, but I’m old these days and can barely see things. I quite liked the questions, they’ve found a way to get more mileage out of 5 Gold Rings ideas. I really wanted to be able to rip into this, but in truth I just can’t. I can’t guarantee it viewers though. Liked a lot of the elements. I do think the chutes are quite far apart – comedically, I feel you want people to be running around more and yet there was a lot of “oh, that’s miles away, I won’t even try”. Is the back of the stage padded? It has no lights in so I assume so, but again there wasn’t anyone really putting their body on the line to make a miracle catch. Have to agree with Dan that the graphics looked great, even if the image rights alone would cost around a grand per question never mind the Photoshopping. Sadly, I can’t follow round 2 because of colour blindness. Bit disappointing this had already happened in two different shows this month. It’s really not hard to find colours that work for 99.9% of your audience. Overall, I think the front game is really lacking some interaction between the pairings. There is almost no point in having to teams if they aren’t going to affect each other’s game. How are you intending that the teams interact? I can’t imagine health and safety sanctioning two people running around at the same time. Shouldn’t you pick the number of people that suits the game you’ve devised, not devise something first then shove two teams on it regardless? I don’t think H&S issues would be insurmountable, personally, but here’s a very minor example of what you could do. Give the other team a set of 10 buttons, and they have to lock in the catchpoint that they would go for if they were catching. If the catcher fails, but the non-catching team pressed the right button, the non-catchers get 50% of the question value as a bonus. There could be quite a lot of extra value in finding out what the other team would have gone for if they were playing the same question. I do find the way you have to nominate a specific position slightly odd. If you want to stand at position 3.5 so that you have 3 and 4 covered, isn’t that your prerogative? This gets much more right than wrong and feels like a minor hit to me. Most of all, it looks like fun to play, and it looks like the players are enjoying themselves. If anything, I’d like to see it being very slightly wackier; in the decoy catch, there’s scope for the decoy objects not to be the same size and shape as the true winning ball, so you could have items being dropped like rugby balls, cuddly toys, foam “1 ton weights” and anvils, frisbees and paper planes that deviate course, and so on. (You’d need to keep this varied, though, and I’d be inclined to keep it dry rather than messy or tasteless.) I also quite like Paddy disposing of the balls on-screen and in my head I choose to imagine that the audience get to knock the big balls around amongst themselves to add to the fun. More seriously, I thought the direction and camerawork were occasionally not as good as they should have been. You need a head-on shot of the contestant preparing to catch the ball every time, and there were a few occasions where it didn’t feel entirely clear what was going on, with a sufficiently skew angle not making it clear which answer the contestant had chosen and which answer was correct in practice. That was sour. As much as I liked the question material overall, I’d ding the jackpot question for importantly not making the weight of the overall cake clear,and there was at least one occasion with a stray uncollected ball in the back of the shot, which felt sloppy. Overall: looking forward to watching more of this! I’m going to do a post about this tomorrow. I agree with a lot of what has been said. Paddy is great at lifting what could be a slightly below average show (Benchmark, Take Me Out) up a peg or two and I feel that with this also. They are really giving it a big chance with lots of promos and between Pointless and All Together Now will also surely lift it a bit too. Will I make an effort to watch? Most likely not but if I’m in on a Saturday I won’t be hunting for the remote if this came on. Very much a sister show to Five Gold Rings, but faster moving and therefore better; I’m glad this has been given a half-hour slot. The set is stunning – I particularly like the use of lasers. The gameplay is really good, and though I thought it would get old fast the variety of rounds and questions keeps it interesting. And I’m glad they didn’t shy away from the “blue balls” joke, unlike that BBC Scotland show the other week. 3.04m for Catchpoint – considering Casualty only got 3.5m, that’s a win. Higher than I was expecting – it will be interesting to see how it does next week. Agree with the consensus that this Quite Good, Paddy is doing a lot of work for sure (but then again that’s probably what you want for Saturday primetime). I like the structure of the show – agree the speed round is the best and I hope we see equally high fun questions on that every week. I also think there’s generally something quite fun about questions of the form: “here’s an ordered set of clues to values, which one matches the value of [other clue]” – like the strictly and football questions were. I wish the speed and cake questions had done something similar (eg. which speed is closest to a cheetah?, to the weight of 10 eggs?). When the answers are unclear pictures (eg. speed record, cake) there should be captions on the screens for what they are, rather than Paddy having to explain it. It’s natural to want to try hedging between two adjacent drops – I’m sad that the game’s infrastructure seems to disallow that for no good reason. At it’s core, the unique thing about this show is seeing folks try to catch a ball from a different answer than they expected. As others have said, this currently seems a bit harder to do than would be the most fun. I also think the play area has a depth issue – it’s not clear where (in a forwards-backwards sense) to stand to best see and catch the balls, and a couple of times it seemed like the players missed chances because they were too far back. Copying their lip would make catches a little easier, and adding the dive would make the catch more dramatic. There’s no benefit in standing in the correct position in the first place. There should have been an extra amount added to the prize money for each question in the early rounds, if they were standing (and then caught the ball) in front of the correct answer. Then, if they scrambled over to the correct answer when the balls were dropped from the guttering above the stage and caught the ball in front of the correct answer, then they would get a lesser amount of money. On which note, though, I’d suggest that the ‘movies’ category was a bit of an outlier in that sense, since in many cases if you’re wrong for a question of that nature you’re unlikely to be nearly right! There are many better things that the show could have done at this point when the winning team decided to keep the money. One: play without risk for a moderately small cash prize – say, another £1,000 or so. Two: play without risk for a comedy tiny prize, like Paddy’s watch or tie if he’d been wearing one, or a token fiver from Paddy’s pocket. Three: the Bullseye solution, which we haven’t seen for a while, where you bring the beaten team out to have a go. Four: pluck someone out of the audience to have a go. FIve: play for a small prize but both contestants get to try to catch the ball at the same time, with some understanding that the contestants shouldn’t run into each other. Completely slipped my mind that it was on. So there we are. In case anyone cares, 2.67m on Saturday. My solution for the payoff was going to be somewhat Bullseye-ish too – offer them £250 for charity if they caught it. Enough to make it worth the emotional pain of catching it, without diluting from the notion that they accepted £X to avoid the gamble so £X is what they should get. Questions were a bit more chestnutty tonight and perhaps overeasy in places (who wouldn’t know the Presidents one)? Despite some good catches by one contestant, they still aren’t in the Takeshi’s Castle league for full bodily commitment. Does the losing team still win the money? I don’t think I’ve seen it mentioned that they go home with nothing. I was thinking if the endgame would be better with a fundamental redesign. One thing that bothered me last week is that they’ve got two players but only one actually participates in the climax; what if they ditched the whole ‘removing answers’ stuff and instead asked two questions on the same board, so each player will have one ball to catch. Give ’em a minute to discuss and get into position, with the balls dropping on zero. No balls caught, half prize awarded; one ball, you win your pot, both balls, you win the jackpot. It means both players get to participate in the final, and crucially, it actually gives the final a distinguishing feature compared to the previous rounds.